What makes you laugh as a gamer? A joke? A line of dialogue or a sight gag? And what’s the target of the humor? Who gets skewered? You? 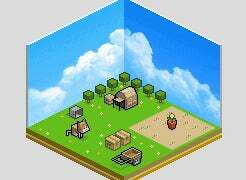 Some might describe the new DSi downloadable, Art Style: Boxlife, simply as a new puzzle game and leave it at that. But it is also a sharp satire of tedium, both of the dreary labor some of us go through to make money and the bland motions we willfully prosecute in video games. Oh, and it’s a game about folding paper into boxes. Brain-Hurting: Yes, this is a good thing. The core gameplay of Boxlife requires the player to use swipes of the DS stylus to scissor and fold sheets of grid-lined paper. Form six connected squares into a box and that box is lifted from the playing field, either to help clear a level in the game’s puzzle-based R&D mode or to win points in Factory mode (better if you build that box around a dropped bomb before the bomb detonates). This is a task you will pray you are never forced to do repeatedly for real work and once you’ve probably seldom had to do under the pressure of a video game timer. It’s not easy. And, early on, you won’t see any of the patterns you need to spot to play well. Later, you’ll be folding like an Origami master. Then, the game gets way harder. The Office, The Video Game: This game is a joke. On purpose. Difficulty levels are named after levels of employment, like part-timer, craftsman and specialist. Scores are all delivered in dollar amounts and displayed in charts styled off of the bland profit-driven line-graphs you could imagine being shown in a corporate boardroom. And what’s the drive? The money earned unlocks lifestyle improvements that gradually improve the quality of our employee hero’s shoe-box diorama of a life. That quaint, pathetic diorama always appears on the games’s title screen. Congratulations! You just earned enough money to swap that guy’s bike with a moped. Happy? This game knows that its gameplay feels like work and that work’s a chore. It knows that, in real life, the rewards and the cheerleading of a company toward those rewards is shallow. Somehow I still had fun. And laughed. This is sharp stuff. Twitchy Control: The game requires precise cutting and folding. But sometimes the stylus felt too fat in my hands, like a pencil from kindergarten. The game occasionally didn’t register the folds I was trying to make or missed my attempt to glue to squares back together. It’s not a common problem, but it’s persistent enough to deserve a mention. If you only need to know if there’s enough entertainment in a game to justify its price tag, then, yes, there’s $5 of fun in Boxlife. But the game will get harder than mere mortals can handle. Don’t be mad.